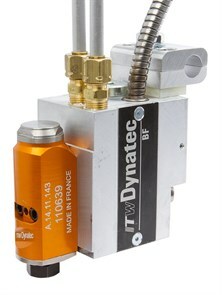 ITW Dynatec's BF Series Mod-Plus Marathon™ applicator head is an air-operated, single or multi-nozzle hot melt adhesive applicator assembly with an integrated filter cartridge which prevents particulate matter from obstructing flow through the head. The Marathon's™ screw-on nozzle seat allows fast and easy change of nozzles, and the optional stroke adjustment allows for fine-tuning of adhesive flow from module to module on large lines. Each Mod-Plus BF applicator features one or more adhesive valve modules mounted to a single service block, simplifying spare parts inventories. Each module operates with air pressure opening and closing the orifice. Air open/air close functionality reduces stringing and gives a clean, sharp cutoff every time throughout the life of the head, unlike spring-operated applicators which cause more stringing as the spring wears and loses tension. Oh, did we mention the air open/air close functionality is standard? In addition, the mounting brackets for the Mod-Plus applicators can be placed on the top or back, allowing for more versatile installation options. High performance seals (which are also standard) improve applicator life, while the platinum sensor allows for better temperature control over conventional temperature control sensors.